Air Force Day is observed in Pakistan every year on September 7. This is one of the professional days, that are connected with the celebration of the end of the Indo-Pakistani War in 1965. 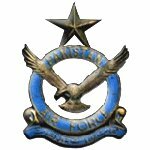 The Pakistan Air Forces were created on August 14, 1947. In 1956 they were given the current name. The air forces took an active part in the Indo-Pakistani War of 1965, and one of the dates of the war is connected with the day of celebration of Air Force Day. The war was a series of conflicts, that engaged aircraft in combats against each other. At the beginning of the war India and Pakistan carried out only minor skirmishes, but on September 6 India attacked Pakistan. The most notable event for the Pakistan Air Force took place on September 7, when Pakistani flying ace Muhammad Mahmood Alam shot down five Indian aircraft in less then a minute. Celebration of Air Force Day features annual airshow program. The airshow is a part of a three-day celebrations, that scatter across the country: Defense Day, Air Force Day and Victory Day.